Metal detecting in Montana is a great pastime. 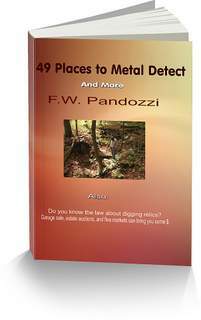 There is so much history to discover, and using a metal detector is a wonderful way to locate that history. However, you need to pay attention to the law that has to do with digging artifacts and relics. The laws that protect State and Federal lands are the laws that I have wrote about for years. Individuals have been arrested, put in jail, and even fined thousands of dollars for not obeying these laws. Do Not Break The Laws! That law is the ARPA law. The Archaeological Resources Protection Act. Here is a summary of the ARPA law, and some of the problems people face who break this law. Even though ARPA does not specifically mention "metal detecting", you need to understand what ARPA says about digging artifacts. As confusing as the above laws may seem, if you are metal detecting in Montana, do not dig anything that you believe is an artifact, or any item that is older than 100 years, especially if you are on any State Lands. For detecting in Montana, town, village and city parks, you'll need to check with those local officials. I was the first to produce a metal detecting, TV series. And the archaeologists tried to shut down my production. Have you tried metal detecting in Montana ghost towns?